Prof. Joseph Tusiani accepting his award at the Lehman College Foundation dinner in October 2015. Governor Andrew M. Cuomo named Joseph Tusiani, a Professor Emeritus of Lehman College, the New York State Poet Laureate Emeritus. Tusiani, who retired from Lehman in 1983, is an acclaimed poet, translator, and novelist. He has published poems, translations, and other writings in four languages: Italian (the language of his homeland); Latin (the language of the Roman Catholic Church in which he was raised); English (the language of his second home, the United States of America); and Gargano (the dialect of the Apulia region of Italy, where he was born, and also his first language). He continues to write a prolific amount of poetry. Later this year, Bordighera Press will publish, A Clarion Call, culled from the many poems he has written since suffering a stroke in 2014. 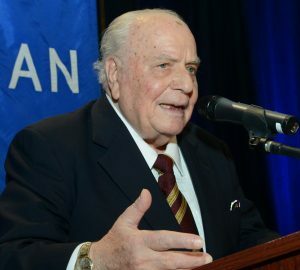 In October 2015 Tusiani was honored for his lifetime achievement in the arts at the Lehman College Foundation Awards dinner. Born in San Marco in Lamis (Foggia) in 1924, Tusiani earned a doctorate from the University of Naples in 1947 with a thesis on William Wordsworth. Later that year, he emigrated from Italy to the United States where he began his career as a successful academic. Tusiani has written numerous collections of poetry. His Latin works include Melos Cordis (1955), Rosa Rosarum (1984), In Exilio Rerum (1985), and In Nobis Caelum (2007); Lo Speco Celeste (1956), Odi Sacre (1957) and Il Ritorno (1992) in Italian; and, Rind and All (1962), The Fifth Season (1964) and Gente Mia and Other Poems (1978) in English.